Well, the Campaign For Real Fear is over, and was everything we hoped it would be. The entries were smart, mad, trying, puzzling, disturbing and every stop in between. We doubled the number of winners and added seven Honourable Mentions because we simply couldn’t narrow it down any further. The big surprise in the statistic was – well, we’re letting Black Static magazine print the stats first, but I’ll add them here after publication. So, the next two issues of Black Static will print all of the winning entries, with comments from Maura McHugh and I on how and why we chose what we did. They’ll go on to be podcast by Action Audio, and hopefully bright futures. So here are the winners. Congratulations to all our winners for writing such memorable stories. We’re saddened we couldn’t take more, which is why we listed seven honourable mentions. There were several other strong contenders we had to put aside with a great deal of regret. We received a range of work from first-time writers through to seasoned professionals. Our final group represents a spectrum of experience as well as showcasing the variety of talent writing modern horror fiction. Thanks & respect also to Maura McHugh, who turned an idea into reality. Check out her blog here. 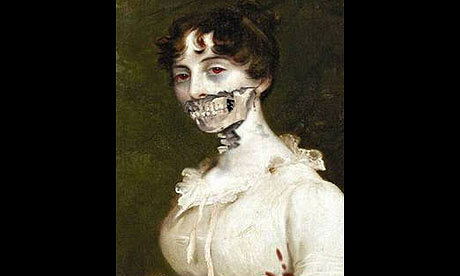 The picture at the top is, of course, from ‘Pride & Prejudice & Zombies’, the one-line joke that became a series of crap books, and is the kind of thing we were fighting against. We’ve asked Black Static if all the contributors can have free copies, which may be tricky as they’re scattered all over the world and the magazine runs on a tight budget. Hopefully you’ll get a freebie, but if not I’d get a friend to order it for you. Campaign For Real Fear: Ten Is Now Twenty!